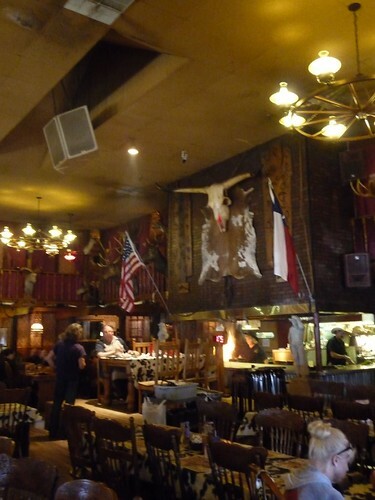 Mali Mish – Day 107: Cars and the Big Texan. 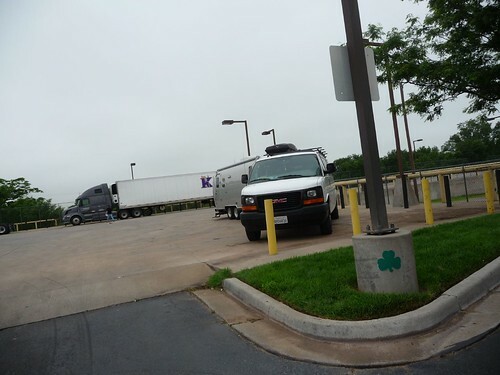 We got here late last night and found a gas station next to a McDonald’s that accommodated overnight parking. We took a chance by passing through a couple of truck stops along the way to get here not knowing what would be here and it paid off. The town was named by an Irish immigrant in the late 19th century to honor his heritage. With a population of just 2,000 people, there is not a whole lot to do here. Well, that doesn’t matter to Ava. Here she is doing her version of the Irish Jig. Take that! Shamrock! Being that we are now officially on the Route 66 portion of our trip, our plan is to revisit some of the historical landmarks of the old road. If Shamrock is ever famous for anything, it would be for a little place called the U-Drop Inn. 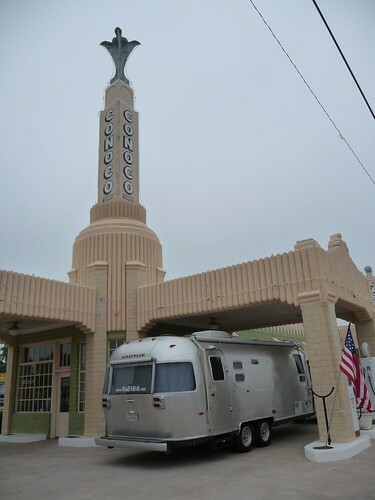 This iconic building was built in 1936 and was a hot spot for travelers between Oklahoma City and Amarillo. With the decommission of Route 66, along with many other popular locations, it slowly fell into disrepair. Today however it has been restored with the help of 1.7 million dollars worth of federal grants dedicated to preserving the landmarks of this road. It now serves as a museum and the Shamrock chamber of commerce. It was not open during our visit so we just pulled right into the old gas station port and got some photo ops with the Mish during our brief visit. 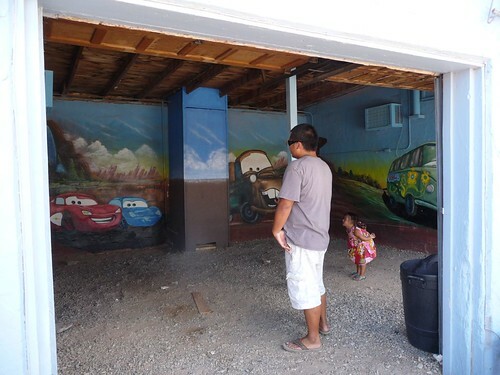 If you have ever seen the Pixar/Disney movie Cars, you probably know that much of the movie revolves around the demise of Route 66. The U-Drop Inn was the inspiration for Ramone’s Body Shop in the movie. 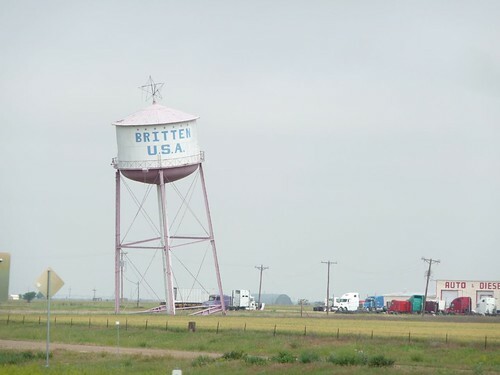 As we left Shamrock and continued out trip west we passed by the city of Groom, Texas where the leaning water tower lives. It looks as if it might fall any minute but in fact it was actually built to look this way. It was never a working water tower but rather a tourist attraction made to get people to stop and spend some money. Well we are not gonna be fooled! 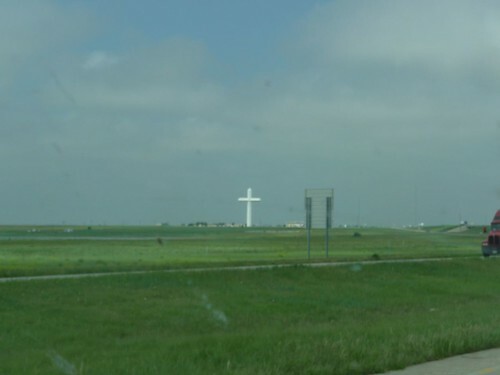 A little bit down the road from the leaning water tower you will also see the big white cross. Being that this is the Bible Belt of America, it seems appropriate to have this here. 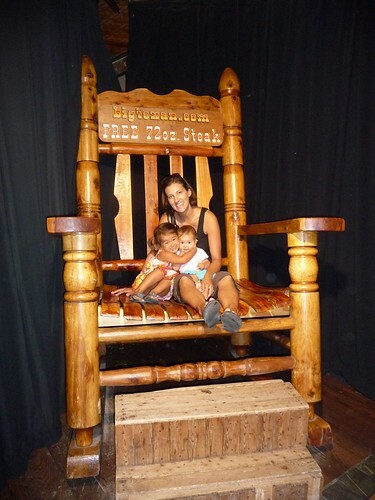 Everything indeed is big in Texas. 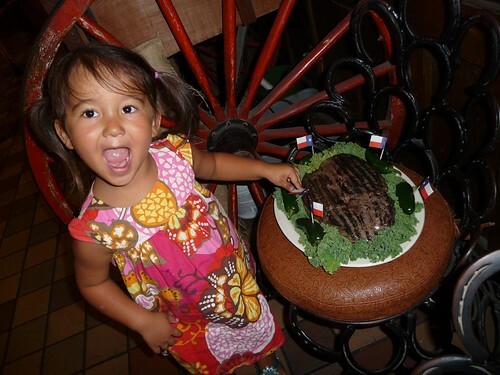 Another stop we wanted to get to today is a steakhouse you might have seen on various Food Network or Travel Channel shows called the Big Texan. For miles and miles even into Oklahoma, you see billboards that boast their world famous ‘Free 72 oz. steak’. That of course is only free if you can finish it in under and hour. Did I mention everything here is big? 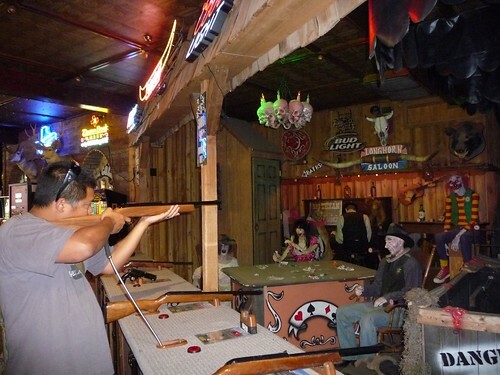 This Texan saloon is complete with an indoor shooting gallery which I had to show the girls my marksmanship skills. I think Ava was not too impressed. Either that or she was a little scared of the zombie ghost whose head explodes when I shoot it with my arcade rifle. In case you have never seen a 72 oz. steak in action, here it is in its complete 4 1/2 lbs glory. That thing is HUUUUGE!!! I thought long and hard about giving this steak a shot but it is just too early in the day for that much meat. Plus I have lots more miles ahead of me today and I just can not imagine feeling like a stuffed pig while doing that. There was a middle age guy however attempting the feat that morning and he was on the elevated table chomping away at his ‘Free Meal’ as we sat down. 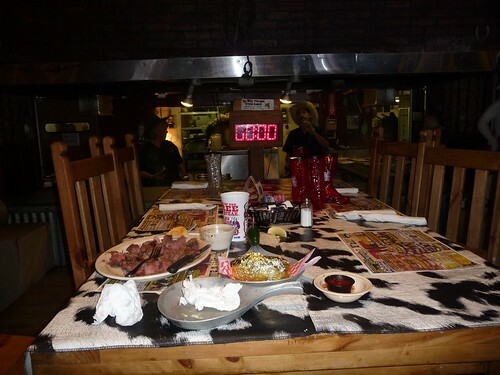 With a countdown clock next to the table that is elevated in the middle of the dining room while a live streaming Web cam broadcasts images of your gluttony around the world, it is no surprise that only 1 of 7 men are able to complete the challenge successfully. This guy didn’t even come close to finishing it. 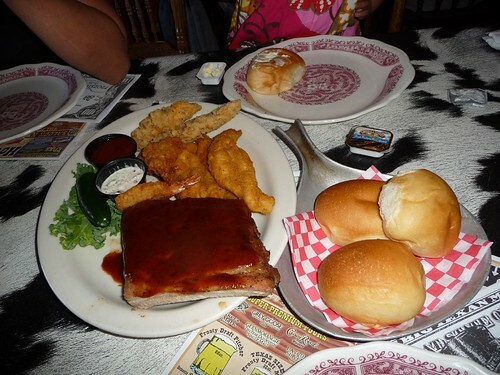 Before you think this is no big deal, consider the fact that it’s not just the steak you have to finish but also the table full of sides that comes with the meal. Of course the advertisement is that the meal is free if you can finish it but for those that fail, be prepared to fork out 75 big ones. Our appetite was not quite as big this morning and in fact we actually split a combo meal which was plenty of food. 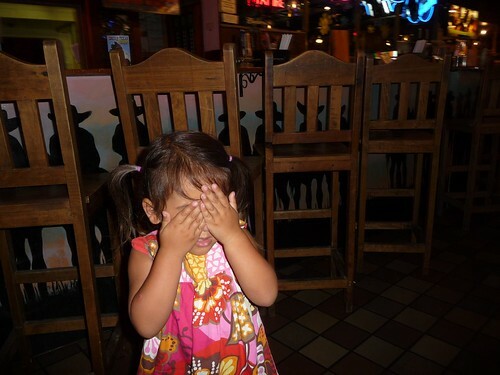 The food was good but our waitress was not quite as satisfactory. We waited forever to get our drinks and when we did get them, she brought the wrong ones. Our attempts to flag her down was only met with her eyes staring right through us as if we were ghosts. 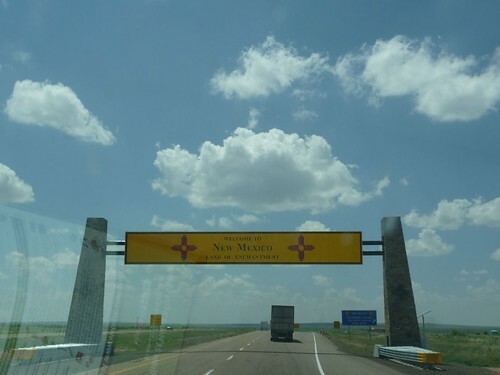 We took that as our sign to head out of Texas and into the great state of New Mexico. The last time we were here we hurried through it with only a 1 night stay in Las Cruces. That visit back in February still ranks up their as one of the best part of our trip since we got to check out the beautiful White Sands National Monument. 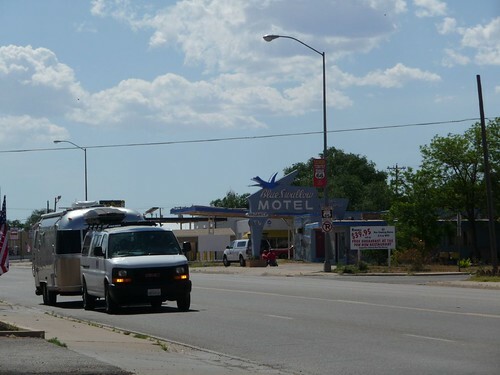 Going along with our Route 66 sightseeing agenda, we decided to stop a little town called Tucumcari, New Mexico. 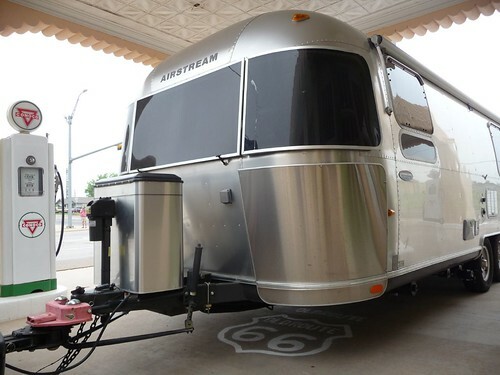 Located between Amarillo, Texas and Albuquerque, New Mexico, it was one of the more happening towns in the hay days of the Route 66 popularity. 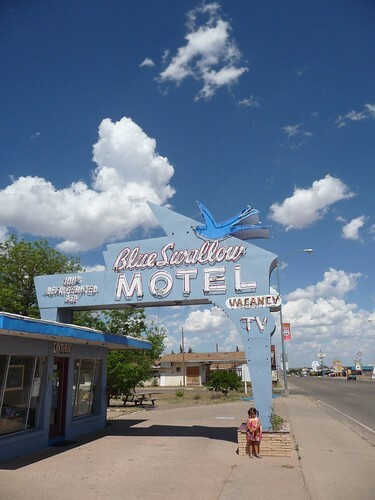 Maybe the most famous place here is this little joint called the Blue Swallow Motel. Also an attraction featured in the movie Cars, the Blue Swallow is a time capsule that takes you back 50 years in time. 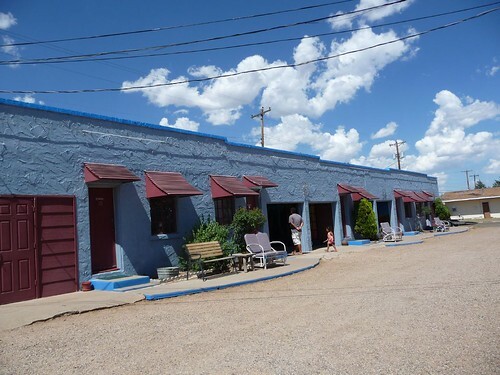 Travelers back in the day would stop at Tucumcari and get a room here to get a night of rest complete with garage for their vehicles. 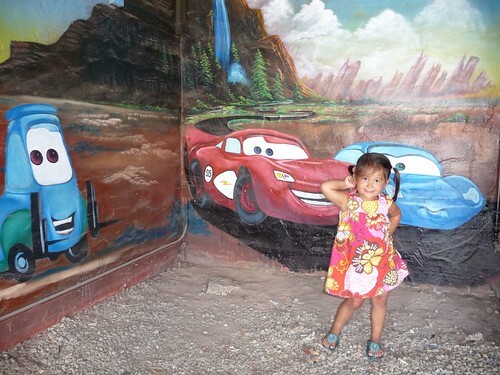 I am not sure if this is a Disney-licensed mural but Ava was excited to see all of the Cars characters inside this garage. Here is Ava striking a pose with whom she likes to call ‘Lightning The Queen’. Many people were hoping that the Pixar movie would bring some kind of resurgence of places like this. I don’t doubt that it probably has made a difference but it probably will never be as it was again. Here is one of the few pictures we have of our rig driving down the road. If you have kids who need to be strapped into car seats, you might know that it’s not quite worth the effort to strap them in for just a quick stop down the street in a hot day like this. Marlene just walked with the girls across the street to check out the Tepee Curio and snapped a picture of me dragging the Mish to meet them. 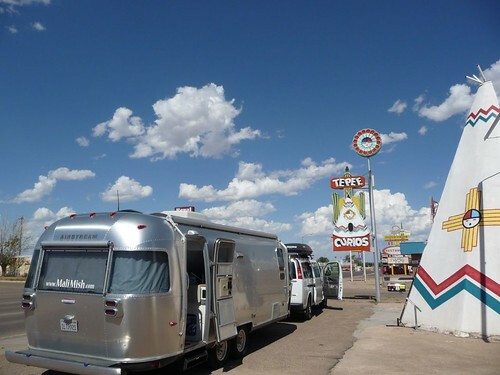 Tepee Curio was also featured in the movie Cars and if you had to pick a city that Radiator Spring was based on, it might very well be Tucumcari, New Mexico. 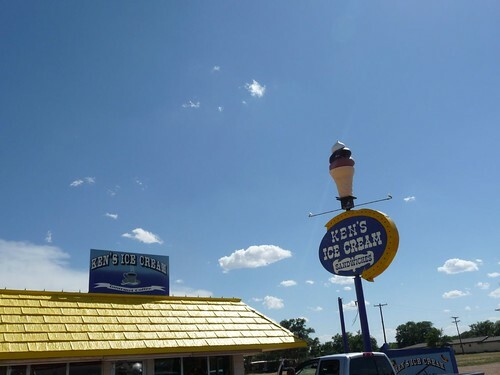 While visiting the gift shop at Blue Swallow, the owners pointed us to Ken’s Ice Cream parlor and warned us about the huge portions. They weren’t kidding. These scoops were huge. Ava could not be happier about it. 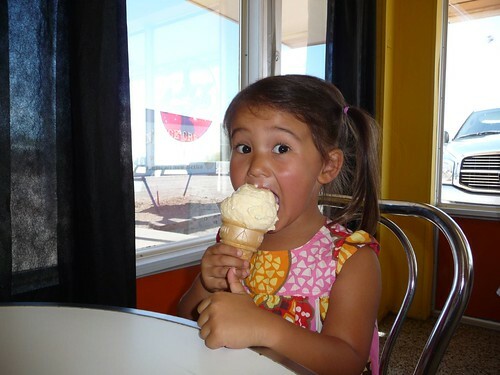 It was a hot day and we had even more driving to do ahead of us and this was quite the refreshing treat during our stop at Tucumcari. 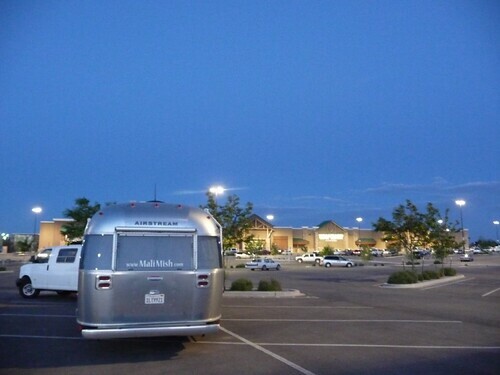 Just before dusk, we pulled into the town of Edgewood, New Mexico just outside of Albuquerque. Another 350 mile day in the bag and hopefully tomorrow we will be able to find a campground to settle in for a few days in Albuquerque. 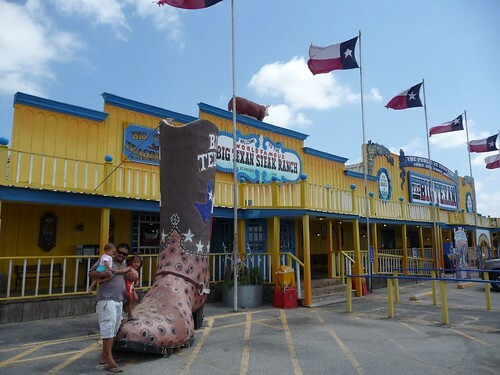 One Response to Day 107: Cars and the Big Texan. We probably met you on the highway somewhere between Albuquerque and Flagstaff. 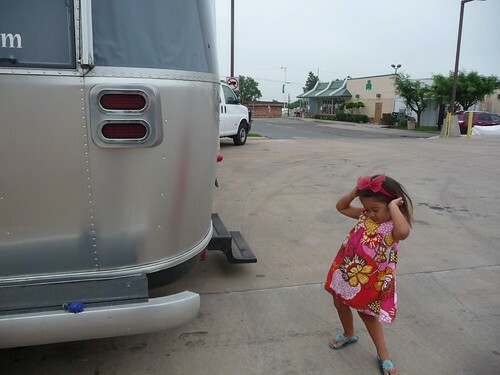 We saw some nice Airstreams along the way. We didn’t, however, spend much time on 66 as we wanted to make it home to Tyler for a couple of days before having to report in to work on the 7th in Temple, TX. Nice to hear you are visiting Texas again.